“Massage?” A tiny Asian woman, cell phone clamped to her ear, asked Eugene as he and I walked down Prince Street in Flushing. “No thank you,” Eugene responded politely. “Massage?” She asked again as she walked briskly behind him. “No…no thank you,” he again patiently answered. She continued her plea; wanting desperately to give Eugene a massage, but Eugene was not having it. 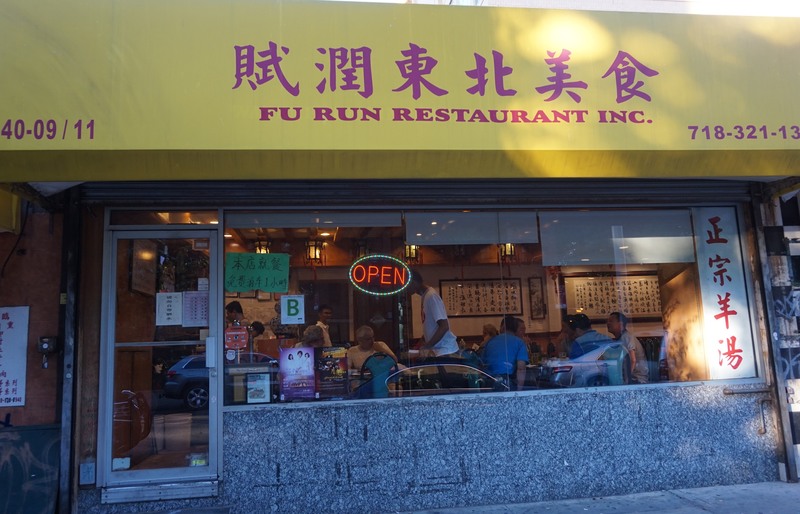 We had just finished feasting at Fu Run restaurant located also on Prince Street in bustling Flushing, where we could see and hear the parade of jets just above us descending onto the nearby LaGuardia runway . 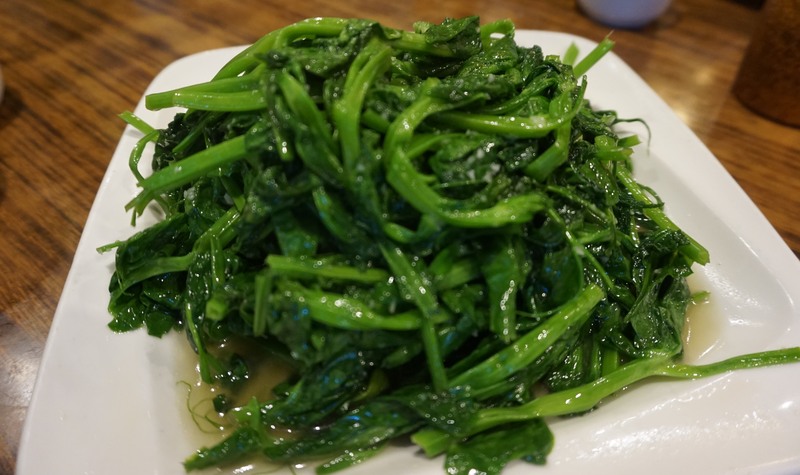 Gerry had chosen Fu Run, finding a particular cuisine our group had not yet experienced called Dongbei, from the northeastern region of China. We were seated at a round table near the doorway and next to a raucous group of Asian men drinking pitchers of beer and eating huge platters of meats and fish that none of us could identify—but wanted..
“You want to ask them what they are having.” I said to Gerry. “I don’t,” he responded with a shake of his head for added emphasis and went back to look into the notebook that was our menu featuring an assortment of color photos of the dishes. “Since its now Ramadan,” Gerry said, “we really should order it,” meaning the Muslim lamb chop. And I would have ordered it whether it were Ramadan, Passover, or Ash Wednesday, its look appealing very much to my secular appetite. While Mike from Yonkers was spending a half hour searching for parking, we took the liberty of ordering, starting with steamed leek and pork dumplings. 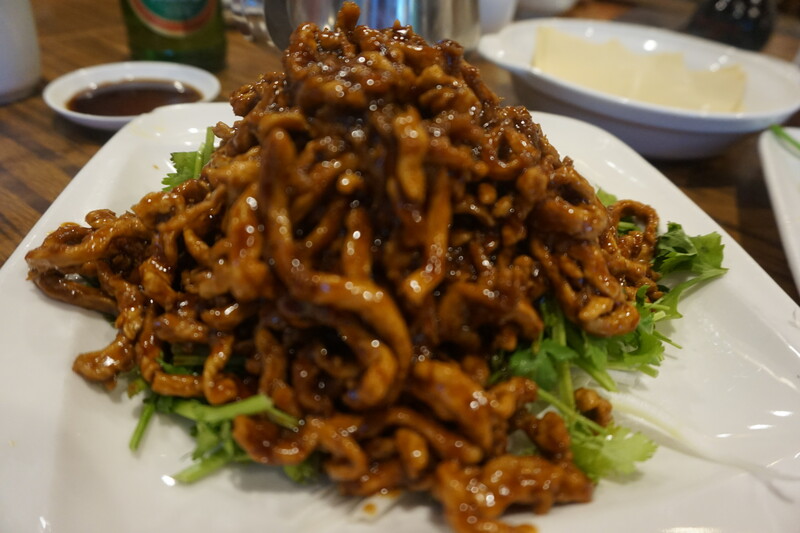 Along with the Muslim lamb, we added a “home style” fish with minced pork,” shredded pork with black bean sauce, and to offset the abundant meat proteins, sautéed pea stems with garlic. The dumplings promptly were placed on our table and, after sampling, were pedestrian at best, helped by dipping into the soy vinegar sauce that accompanied it. Instead of crowding our table with all the entrees at once, we were brought one at a time beginning with the pea stems. Sautéed to tender perfection, we made quick work of them. Waiters in stiff white shirts and ties quickly cleared the pea stems and next the pork arrived. Somewhat sweet, the moist, crisp strips of pork were as good as any bar snack and went well with our beer. Just as we were finishing the pork, the majestic and sizable Muslim lamb chop was centered on our table. The crust of cumin, chili peppers, sesame seeds and other Middle-Eastern spices obscured the chops that looked more like a half a rack of baby back ribs. 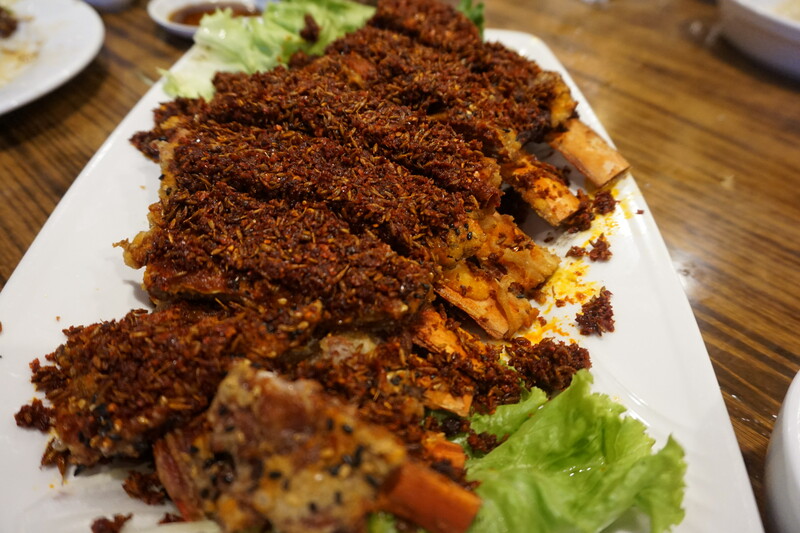 Though Dongbei cuisine is not noted for its spice, after a few bites through the thick crust on the lamb, a slow burn along the lips and inside the mouth took over appealing to our masochistic tendencies. Each rib was hefty enough to satisfy our well documented appetites, but Mike from Yonkers went back for more; the ribs were piling up on his plate. 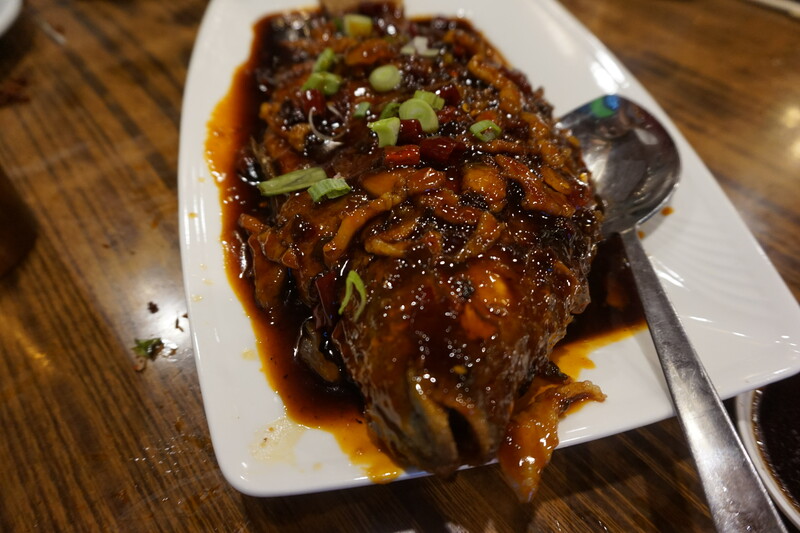 I was also tempted to add a few more lamb chop bones on my own plate, but waited instead for our “home style” fish which arrived soon after and I quickly used my chopsticks to separate the juicy white flesh from the fish’s carcass. Even with a few yet to be gnawed on lamb chop ribs on his plate, Mike from Yonkers attacked the defenseless fish, turning it over expertly so he could shovel the the substantial flesh on its underside into his already overflowing mouth. Nothing remained on our table and though our bill was slightly higher than we aim for, no one was complaining. Well, almost no one with the exception of Eugene whose numerous complaints are an essential part of our meal time discourse. Without them our conversation would be even more mundane. ““What was she saying?” Eugene asked me as we got into my car, referring to the woman chasing him down Prince Street. “She wanted to give you a massage,” I told him. “Why would she want to do that?” He asked, incredulous. “I guess you look tense,” I said. I said nothing instead concentrating on maneuvering the car away from the numerous garbage bags that were overflowing onto Prince Street and out of the congestion that was Flushing.